After the flood waters receded, Noah let the animals out and left the ark with his family. He then worshipped God and offered a sacrifice. A look into various celebrations of thanks reminds us all of the benefits of gratitude. In return for Noah’s expression of thanks, God put a rainbow in the sky and made a promise to never flood the entire earth again. God painted bright colors in the sky as part of the thanksgiving celebration. When we come through a stormy time, we should pause and thank God for his protection. This simple meal celebrated a victory and gave the victory and thanks to God. Abram presented the king with a tithe, a gift of thanks. We should be generous with our blessings too, and give an offering to God who blesses us with so much. The Israelites left the slavery of Egypt and watched the miracle of the Red Sea opening up for them to pass and then close back to swallow their enemies. They gave thanks to God with a song describing the miracle. Miriam, sister of Moses, led women to dance and play timbrels. The people rejoiced loudly. Joy overflowed in their actions and voices. The freedom from slavery is remembered at Passover. Joyful celebrations should include praising God. When we feel real joy, it overflows in our voices and movements. We celebratefreedom with gratitude. Fifty days connected two feasts that focus on thanks for the harvest: the Feast of First Fruits signaled the beginning of the spring harvest; and Shavu’ot/Pentecost celebrated the end of the spring harvest. Pentecost was the only feast day celebrated with leavened bread. Crops that produce food remain important for our health and strength. God calls us to be thankful for our food and those who toil to grow it. For the Israelites, these feasts called for national thanks. Those feasts are the closest celebrations to Thanksgiving in America, when we as a nation thank God for our blessings and the harvest. David paraded and passed out cakes after returning the ark and giving offerings to God. David leapt with joy and danced with the people. He gifted each woman and man two cakes from him, one with dates and the other with raisins. The Ark of the Covenant contained the Ten Commandments,the rod of Aaron, and the jar of manna and signified the presence of God. Only David’s wife, Michal, did not join in the celebration. Everyone around us may not have a thankful heart, but we can choose to rejoice. We can share our food and give thanks to God for His presence in our lives. For those who do not join in, we can pray. During Feast of Tabernacles, people build booths made of branches that are partly open to the sky and recall God’s provisions for those forty years spent in the wilderness. The Israelites experienced God’s continual and constant care. A night under the stars brings us back to creation and appreciation for all God made. Solomon and the people celebrated this seven-day feast after the dedication of the temple. Thanksgiving is a time that can bring joy and happiness. In 2 Chronicles 7:1, the people went home after the celebration happy and rejoicing. This serves as a reminder to thank God for shelter and for His continual care for us wherever we live or travel. After rebuilding the wall around Jerusalem, Nehemiah and Ezra set about restoring people’s relationship with God. They listened to God’s Word and repented, then celebrated. This renewal culminated with the dedication of the people and the wall. Everyone paraded on the wall around the city with music and instruments. The joyful noise sounded out so loudly that people far away heard it. We should be thankful that God restores our hearts. Thanking Him with music and song adds joy. The king’s law to execute all Jews turned into a celebration with a new decree that allowed the Israelites to defend themselves. This became a victory and a holiday called Purim, still celebrated every year with feasting, rejoicing, and sharing gifts with the poor. We are called to celebrate that God delivers us, and to be thankful for leaders who support us and allow us to worship freely. Many commentaries suggest that Jesus followed the traditional Jewish custom of blessing bread before eating. The familiar blessing used the words "May God, the Ever-blessed One, bless what he has given us!" This time, the thanks before eating produced a miracle and feast that fed many. Jesus broke the thin cakes of barley and kept giving the bread and fish to the people to pass out to the crowd. Everyone ate until they were satisfied. God provides for us. We should follow the example of Jesus and give thanks for our food. That’s the way to begin a feast! The son had turned away from his family and faith to live a selfish life. When he repented and returned, his father killed the fatted calf and held a celebration. His household joined in the festivities. He hugged his son and gave him new clothes and a ring. The feasting included music and dancing. His older son grumbled, and the father responded by gently sharing his heart and reason for celebrating. When someone accepts God and chooses to return to their faith, it’s a great reason to be thankful and celebrate. Restoration and forgiveness are reasons to be thankful and celebrate. Jesus shared this gift before the meal when he fed the 5,000 and stated that He is the Bread of Life we need that gives us eternal life (John 6:51). The gift of Communion/Eucharist and the new covenant is a gift of life and relationship with Christ. It’s foretold in Jeremiah 31:31-34 and described in Hebrews 8:6. The prophet shared that with the new covenant, God’s law would be in people’s hearts and God would forgive their sins. We rejoice as we break bread and celebrate that Jesus is with us, along with his gifts of forgiveness and eternal life. The prophecy speaks of a lavish feast and a time when there will be no more death. We will rejoice in our salvation then. Revelation 19:9 refers to this celebration as the marriage feast of the lamb, the feast in heaven and continues on to share that it is time to rejoice, be glad, and give God glory. His glory is indescribable, and we will rejoice greatly. 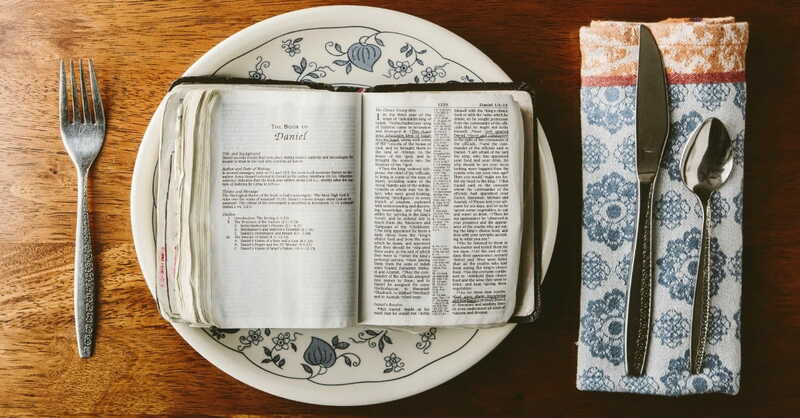 As you enjoy a Thanksgiving feast this year, pause to share the many reasons for our gratitude and consider reading passages about one of the biblical feasts aloud. Karen Whiting (www.karenwhiting.com) loves cooking and sharing meals, bread, and insights into bread in the Bible. Her latest book, a devotional cookbook, is The Gift of Bread: Recipes from the Heart and the Table. A writing and markeing coach, Karen’s credits include twenty-five books, several hundred articles, hosting a television show, and speaking internationally.